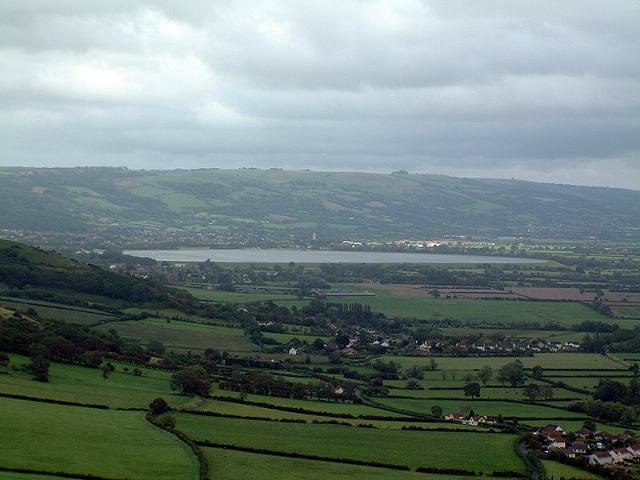 Cheddar reservoir (or "Axbridge" as it is commonly known) is situated approximately 15 miles south-west of Bristol, just south of the Mendips, and is run by Bristol Water. The reservoir is roughly circular, two-thirds of a mile in diameter, giving ideal length reaches. The sailing is run on a member's and members' guests only basis from Bristol Corinthian Yacht Club. Sailing is only permitted when there is a safety boat manned or at least available. The Club is open on Saturday and Sunday all year and on Wednesday evenings (from about 5.00pm) from early April to early September. Like most man-made reservoirs, Axbridge is concrete sided so the sides are not particularly kit-friendly. However in front of the car park and beyond the clubhouse there are grass areas for rigging up. Axbridge's location, with the Somerset levels to the south, and the raised water level relative to the land means that most wind directions give clean wind. However when it blows over the Mendips it is extremely gusty! The day sailing fee is currently (July 2002) £5 per person, and a member has to sign you in, but that could be the duty member. Drive south of Bristol on the A38, turning left towards Cheddar & Axbridge on to the A371. After one mile, just past the 40mph sign, turn right signposted Axbridge. After 100m the lane to the reservoir is a narrow entrance on the left. The gate to the reservoir may be locked, but it won't be long before a member arrives with a key. Alternatively park to the right of the gate and walk to the clubhouse to borrow a key. N - Very gusty - avoid! NE - Very gusty - avoid! No tide, but the water level does ususally drop in the summer and by late summer/early autumn becomes very low and the weed becomes very high. On rare occasions the club has had to close for a few weeks due to lack of water. When the water level drops below the concrete apron in front of the clubhouse, the bank is then steep sided and can be very slippery. In this case it is probably best to launch to either side of the clubhouse, and especially when the mud beach is exposed, this is the best place to launch. On Sundays and Wednesday evenings there will be dinghies racing around the lake but it's usually not difficult to avoid them. However on regatta days - mainly in the spring - the water can get very busy. Club house - manned by the club members on a rotation basis providing changing rooms, showers, toilets and galley. The galley serves a hot meal on Sunday lunchtime and Wednesday evening, also rolls & snacks & hot drinks. Self service hot/cold drinks on Saturday ans a well stocked Bar on Sunday & Wednesday, but no draught beers, only cans. Rescue cover - again manned by the club members on a rotation basis. Plenty of parking & rigging space. The Lamb in the centre of Axbridge is a great pub for atmosphere, food and beer. Content supplied by Al Donald.